The Singapore Mass Rapid Transit (MRT) network of today is a rapid transit network spanning across Singapore, with 5 inter-connected rail lines spanning over 170 kilometres in length and 102 stations (as of mid-2017). It forms the backbone of public transport in Singapore, with trains travelling along high-density travel corridors, connecting town centres to the City. The MRT system was born out of many years of conceptualization and debate. We present a detailed and comprehensive history of the MRT in this article. This page mainly deals with the conceptualizing of the MRT, and detailed histories of individual rail lines will be allocated under their dedicated articles. In 1967, two years after the Independence of Singapore, a four-year State and City Planning study began to access future land use and transportation needs in light of the Government’s overall development policies. Jointly undertaken by the Singapore government and the United Nations Development Programme, the study concluded that it would not only be environmentally unacceptable but physically impossible to build roads demanded by the growth of private automobiles. As such, it recommended that a Rail Transit System was necessary by 1992. The study served as the basis for subsequent transport policies in Singapore, including programmes to limit the growth of car population and efforts to build a modern Rail Transit System. It would take a long ten years from 1972 to 1982 before the Government finally decided to build the MRT. A three-phase Mass Transit Study was carried out between 1972 and 1980 to examine the issues raised in greater detail. Phase One (1972-74) examined the costs and benefits of five alternative mass rapid concepts, including an all-bus system. It recommended that Singapore’s overall objectives could be best achieved with a rail-based system combined with a complimentary bus network. Phase Two (1975-78) confirmed that a rail system operating through the most densely-populated areas would be economically and technically feasible. It also recommended a basic route: two operationally-separate lines running east-west and north-south through the City Centre. Despite the study’s recommendations, the Government did not immediately commit to the building to the MRT, primarily due to fiscal concerns and the possible impact on land use plans. Furthermore, the World Bank criticised the Phase Two study, raising issues with the costing and assessment of the relative benefits of the bus-rail plan compared to an all-bus system. Despite the mixed opinions, the MRT option was preserved, and Phase Three (1979-80) established a preliminary engineering design for the MRT, identifying station locations, alignment and budget estimates, and suggested that a 45-kilometre system be built at S$3.9 million at December 1979 prices, excluding the cost of land. 3.Recommended a limited rail MRT system about half the length of full system proposed in Phase II and costing 30 per cent less. The decision process took a long time as the government had to weigh the benefits of the investment against the great cost of building it at a time when Singapore needed funds for urgent housing development, education and defence. Mr Ong Teng Cheong, then-Minister for Communications (now the Ministry of Transport) and later the 5th President of Singapore, was a strong proponent of the MRT system. He argued that the estimated S$5 billion in cost was necessary for the long-term economic growth and development of Singapore while enhancing the country’s image and improving the standing of living for its citizens. However, he faced strong opposition from other Cabinet ministers, especially Finance Minister Dr Goh Keng Swee, who were against the especially heavy cost of building the MRT. Believing in an all-bus system instead, Dr Goh Keng Swee even invited Harvard professors to come out with a report to support his case. Furthermore, then-Trade and Industry Minister (and later 7th President of Singapore) Dr Tony Tan called it ‘foolish’ to build the MRT in the face of rising construction costs, stating that public housing was a priority. In 1980, the predictable outcome was forestalled by a preliminary report produced by a team of Harvard economists led by Kenneth Hansen. Better known as the Hansen Report, it argued that earlier studies underestimated the potential effectiveness of an all-bus system based on incorrect assumptions which failed to consider other approaches to solving Singapore’s transport problems. If an MRT system were to be built, the suggested that only one line be built, as it would be sufficient to relieve traffic congestion and allow the bus system to function. The preliminary and final reports of the Hansen Team caused considerable consternation among the MRT system’s proponents and prompted concerned government officials to release what had hitherto been confidential reports to defend the railway alternative. 2. Several alternatives to MRT not considered including elevated construction and people movers 1. ‘Backbone’ system most cost-effective but not sole criterion (other reasons included road congestion; linkages with urban structure, etc. As the debate continued, a Provisional Mass Rapid Transit Authority was established in July 1980. An MRT Systems Design Option Study refined technical details and recommended measures, such as platform screen doors and third rail power transmission. In September 1980, the debate was brought to national television. A Comprehensive Traffic Study (CTS) appointed two independent American transport and urban planning specialist teams to conduct their own independent reviews. It concluded that an all-bus system is not practical and recommended go-ahead of a mass transit rail system. In the end, the argument for the MRT edged out as it was felt that an all-bus system would impose considerable traffic externalities to all users; and developments in the CBD would have to be scaled back to give enough space and priority for buses. Furthermore, it was felt the MRT would be an investment to the economy by improving Singapore’s competitiveness in attracting the kind of higher value-added investments desired, especially in the financial and business sector. The MRT would also boost investor confidence and have a multiplier effect on real estate values. Finally, in May 1982, the Government announced its decision to build the MRT system at a capital cost of S$5 billion with a completion deadline of 1992. Then Singapore’s largest public works project, its construction and deadline were an ambitious undertaking for the time. Within six months of the announcement, the Provisional Mass Rapid Transit Authority was calling for tenders. In September 1983, the Mass Rapid Transit Corporation (MRTC) was incorporated, taking over the roles and responsibilities of the Provisional Mass Rapid Transit Authority, along with the awarding of the first major tunnelling contract. Construction called for 67 kilometres of track to be constructed, along with 42 stations, of which 26 would be elevated, 1 at grade and 15 underground. 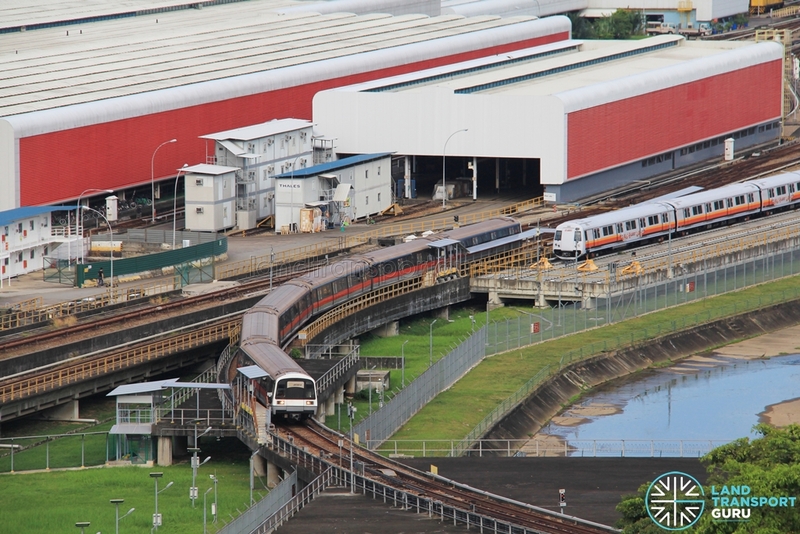 Also included were three train depots at Bishan, Ulu Pandan and Changi. Two MRT lines would be constructed in a north-south and east-west alignment intersecting in the City. The North South Line would run from Yishun to Marina Bay, while the East West Line would run from Boon Lay to Pasir Ris, with a Branch Line to Choa Chu Kang splitting at Jurong East. The network was constructed in stages, with the North South Line given priority as it served the densely populated housing estates of Bishan / Ang Mo Kio, as well as the Central region. On 22 October 1983, the ground-breaking ceremony was held at Shan Road. Construction began in stages from October 1983 to January 1988. 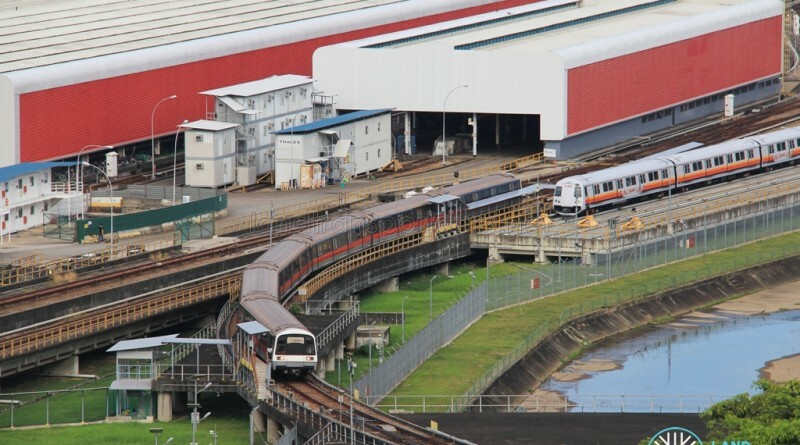 The timing of the MRT worked to Singapore’s advantage – the early 1980s recession led to considerable savings as contractors competed for work, and the nearing completion of the Hong Kong MTR system made expertise readily available on which the MRTC was able to draw. The long period of planning proved an advantage – land had already been set aside for use, and disruption to road users was able to be kept to a minimum. Singapore Mass Rapid Transit Limited (SMRT), the private operator of the new rail system, was established on 6 August 1987 to take over operational roles and responsibilities previously held by the MRTC. Sixty-six (66) trainsets comprising six cars each were procured. They were manufactured from 1986 to 1989 by a Japanese consortium led by Kawasaki Heavy Industries and joined by Nippon Sharyo, Tokyu Car Corp (now J-TREC) and Kinki Sharyo. The first C151 train was delivered to MRT Corporation on 8 July 1986 at Bishan Depot. The first 6 kilometres of the North South Line between Yio Chu Kang and Toa Payoh was opened on 7 November 1987, marking a milestone in Singapore MRT history. Second Deputy Prime Minister Ong Teng Cheong described it as an incredible achievement after a long and difficult 20-year affair, akin to the delivering of a new-born baby. Public response was overwhelming, and just three weeks after the opening of the North South Line, the MRT recorded its first millionth ridership. The rest of the system opened in stages, including sectors of the East West Line, and all 42 MRT station were operational by July 1990, two years ahead of schedule. Transit Link was established by SMRT, SBS (Singapore Bus Service) and TIBS (Trans-Island Bus Services), to take care of Bus-MRT integration, information integration and fare integration. By November 1990, it rolled out a similar ticketing system for both buses and trains, relying on the magnetic farecard. The organisation, which oversaw fare review matters, also coordinated many bus service rationalisations. It was absorbed into the newly-created Land Transport Authority in 1995.